Growing up, Ben Phelps turned to food to deal with stress, depression, and anxiety. He wanted to get healthy for his family and their future, but he lacked confidence because all of his previous efforts to lose weight resulted in failure. When Ben discovered the book The Primal Blueprint however, his hope returned as he saw the simple, practical, and primal approach as something he could literally and figuratively sink his teeth into. Eating delicious primal foods and working out with a movement-centered approach, Ben lost over 120 pounds and is now following his dream of competing in mixed martial arts and is even studying to be a personal trainer. We usually start this show talking about our guests, but before we do that, Tony has a story to share, about himself, that you might not know. It's a story that starts almost twenty years ago, back to the summer of 1998, the summer before Tony started his freshman year of high school. It was only a few weeks before the start of the school year, and, as is often the case, he had to get a physical before he could complete the enrollment process. "During the exam, the doctor noticed a lump on my throat and after further investigation, it was determined that I had a potentially cancerous cyst on my thyroid gland. I was only 14 at the time, so I really had no idea what was going on but nevertheless it was decided between my doctor and parents that a partial thyroidectomy to remove the half of my thyroid gland that had the cyst on it, was the ideal course of treatment. I don't remember being scared as much as I felt like I was on a ride that I had no control over. The train had left the station and I was a passenger who had no choice but to go on to the next stop. I remember going into the hospital and being prepped for surgery, getting the anesthesia, and then everything going black. The next thing I knew I was awake, but I couldn't lift my head and everything above my shoulders was in pain. What felt like seconds to me was actually more than five hours, during which the doctors had my throat completely opened up while they debated what to do. When they initially opened me up, they sampled a piece of the cyst, but it didn't check out with any known cancers. This uncertainty led to fear and this fear led to them deciding that instead of removing half my thyroid gland, they would remove the whole thing. As lab tests would later prove, I did not in fact have cancer, but once your thyroid gland is gone, it doesn't come back and from that moment on my life was dependent on thyroid replacement medication. The medication I was given is one of the most commonly prescribed medications in America, it goes by the generic name levothyroxine, or the brand name Synthroid. Every six months I would get blood tests, visit my endocrinologist, and get my prescription renewed. They always tested for TSH, thyroid stimulating hormone, a signaling hormone produced by the pituitary gland that supposedly indicates whether you have too little, too much, or just the right amount of thyroid hormone in your body. As it was, my TSH levels were on a perpetual roller coaster, and my Synthroid dosage was constantly being changed. I had bags under my eyes, would fall asleep in the middle of the day, and never felt really energetic, but my TSH levels were good and so I soldiered on. I started working out, began to eat healthy, got into the fitness business, and began my career, always assuming that everyone felt the way that I did. But, when I cured my chronic knee pain with barefoot running and resolved years of binge eating with a paleo diet I started to question the conventional wisdom. I started to wonder what was really going on with my thyroid and began to investigate whether or not synthroid was the best way to treat it. As I looked deeper into the issue, I discovered that there were entire websites, books, and communities of people online who had many of the issues I did. I learned that natural thyroid replacement made from desiccated pig thyroids used to be the gold standard, but when synthetic thyroid, ie synthroid, was discovered and marketed, the pharmaceutical company that made synthroid went on a mission to discredit natural thyroid replacement, convincing doctors that it was unreliable, inconsistent, and unsafe. With this knowledge, I demanded that my doctor switch me to a modern natural thyroid replacement called Armour thyroid. He wasn't an endocrinologist and didn't really seem to care too much about what I did, so he wrote me the prescription without resistance and I got my natural thryoid hormone. On Armour thyroid I began to come back to life again. The bags under my eyes began to go away, the mid afternoon crashes disappeared, and I realized that I didn't have to do cardio for hours a day to maintain my weight. The realization slowly began to creep into my brain that for all those years I had been a victim and didn't even know it. I wasn't a victim of any single person, doctor, or drug, I was the victim of an entire system that puts profits before people. That's why I was so excited to meet Elle Russ." Elle found out who Tony was through his work with Paleo Magazine and she reached out to tell us about a book she was working on that dove into the subject of thryoid health, but from a Paleo perspective. She is a thyroid health advocate who had herself suffered from years of medical mismanagement and she too had to learn the hard way. We had a great conversation about the proper ways to dose natural thryoid hormone the nuances of t3 and t4, and how TSH alone is not a good indicator of thryoid function. We didn't record this conversation, but when Elle's book, the Paleo Thyroid Solution, was finished, we invited her to come on to Paleo Magazine Radio to share her story with you. Little did we realize that she was about to change Tony’s life in a very significant way, but we’ll let you listen to find out how. Send Photos of How You Enjoy Bone Broth Protein! We first saw Jamie Lynn Brazie on Instagram. 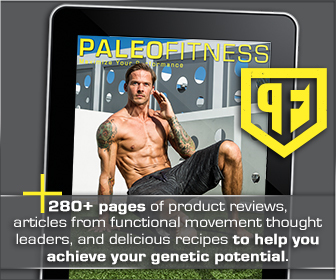 At the time, Tony was editing Paleo Fitness Magazine (all 6 issues are now available in an ebook compendium btw) and we were promoting the #paleofitnessarmy hashtag. We occasionally searched the hashtag to see what people were posting and on this particular day one of Jamie's photos came up. She was sitting on the beach in the lotus position, and as a lifelong Floridian, Tony immediately recognized the scenery. They both hailed from a similar part of the state, so when it came time to scout for a cover model for our fourth issue, Tony thought it would be cool to feature a local girl. Jamie and her husband are now living out in the Pacific Northwest, but she is still bringing that Florida sunshine and sharing the message of health out west. After the Ancestral Health Symposium ended, one of the show organizers, J. Brett Smith approached us and said he had organized an impromptu meeting outside the conference hall and he wanted us to bring the audio recorder because what was about to be said was going to rock the Paleo world. Brett assured us that the assembled group represented a rare gathering of thinkers on the subject of plants. Despite the conventional wisdom that we need to eat a wide variety of fruits and vegetables, this group's controversial position is that fruit's and vegetables are overrated, unnecessary, and maybe even toxic! According to the eclectic group of PhDs, authors, self-experimenters, and more, plants have been engaging in chemical warfare, which of course sounds like dirty tactics until you consider that they lack the ability to scurry away or fight back with tooth and claw like animals do. So, without these things they've had to develop an entire arsenal of insidious chemicals to ward off predators like us. We've never really questioned the benefits of eating fruits and vegetables but the evidence presented by this panel was compelling and certainly dims the health halo surrounding plant based diets. Today we're continuing our coverage of the 2016 Ancestral Health Symposium with a conversation with Chris Masterjohn of the Daily Lipid, Darryl Edwards, the Fitness Explorer, and Dr. Terry Wahls, creator of the Wahls protocol. This interview was originally featured as a Facebook live video on the Ancestral Health Foundation's Facebook page, but we wanted to make sure that you, our dedicated PMR audience, got a chance to listen in as well. And since we weren't about to cut any of these interviewees off, today's show is a bit longer than a typical Paleo Radio Bite, so we'll get right to the chase. It's not often you get three heavy hitters like this all in one show, and I think you're going to learn a lot from hearing what they have to say. Enjoy. What's the best dietary sources of vitamin K? And whether or not there are any studies to back up our intuitions about organic produce and grass fed meat.